Our vacation is over and now it’s time to get ourselves in shape for the Des Moines Register Annual Great Bike Ride Across Iowa (RAGBRAI). It’s true that there are still 37 days left before the ride starts but we do need some training rides that match the conditions on the real ride. Our travels and adventures over the past 6 months often included bike riding, but we were mostly on rails-to-trails bike paths and we didn’t do rides that were very long. Especially for me, I’m anxious to start using the road bike that I will have on RAGBRAI, instead of the hybrid bike that is the one I’ve been using on our travels. 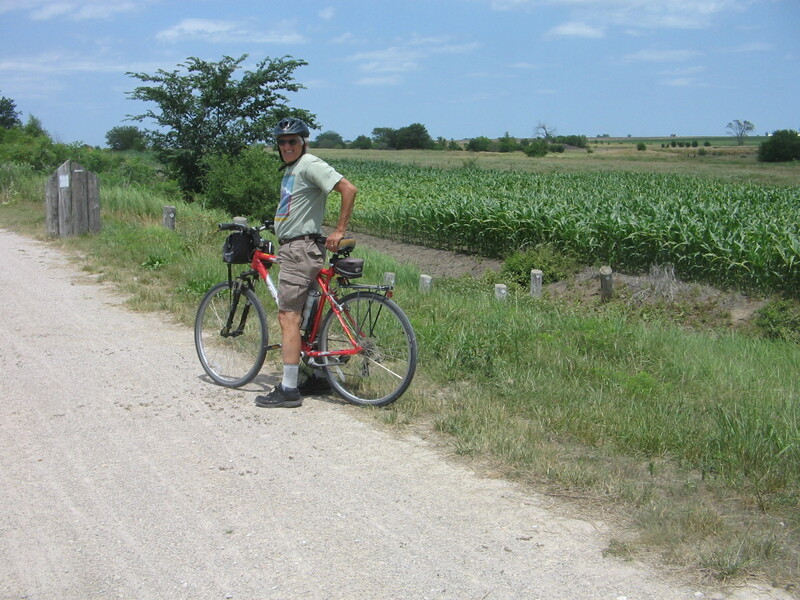 It’s important to get riding time on the bike that you plan to use for the week of RAGBRAI. Before we left the West on Monday to make our way back here to the Midwest, we had a wonderful weekend with friends in Boulder, Colorado. They hosted us for the weekend at their cabin, which is on the eastern edge of Rocky Mountain National Park. The pictures and descriptions of our Rocky Mountain adventure are posted here. There are a lot of miles of plains and prairie to cross on the trip from Boulder to Jefferson City, Missouri. Most of what we did this week was just grind out those miles on the interstate, not spending a lot of sightseeing time along the way like we usually do. Maybe we have gotten too spoiled by all of the beautiful country we have seen in the West and are blinded to what eastern Colorado and the state of Kansas have to offer. We did spend one relaxing evening camping at Eisenhower State Park in Kansas. It was a nice campground on a reservoir about 30 miles south of Topeka. At the park visitor center we picked up a brochure on Kansas state parks and noticed that not too far away from where we were there is a state park, the Prairie Spirit Rail Trail State Park. We made plans to break camp early enough Wednesday morning to allow ourselves some bike riding time on the Prairie Spirit Trail. The weather forecast for Wednesday called for afternoon winds from the south. 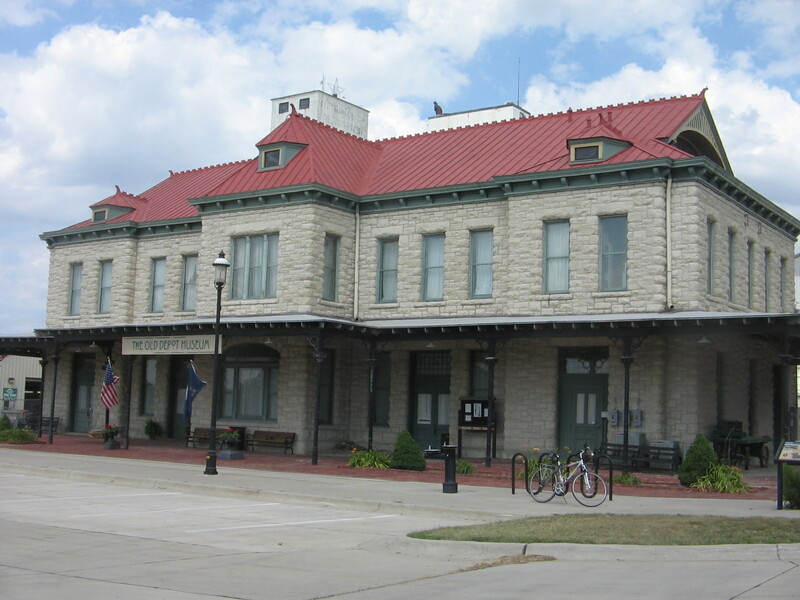 The Prairie Spirit Trail has a northern terminus in the town of Ottawa, from where it passes through a number of small towns before ending to the south in the town of Iola. Given the wind conditions, it made sense to start riding south from Ottawa, pedal for awhile and then when we were ready to turn around to go back to our car, we would have a tail wind. We got a good workout and enjoyed our day of riding on the trail. One of the most interesting incidents happened just before we reached the town of Richmond, which was our turnaround point. On the trail in front of us we saw a parked pickup truck with 2 men taking a lunch break from their task of trimming brush and trees along the trail. We struck up a conversation with one of the men, who was quite helpful in answering questions about the trail. Before continuing our journey we learned that we had been talking to the manager of the Prairie Spirit Trail. What a surprise that he should be out there trimming trees on the trail. Also, we were surprised by some of the history we learned from him. 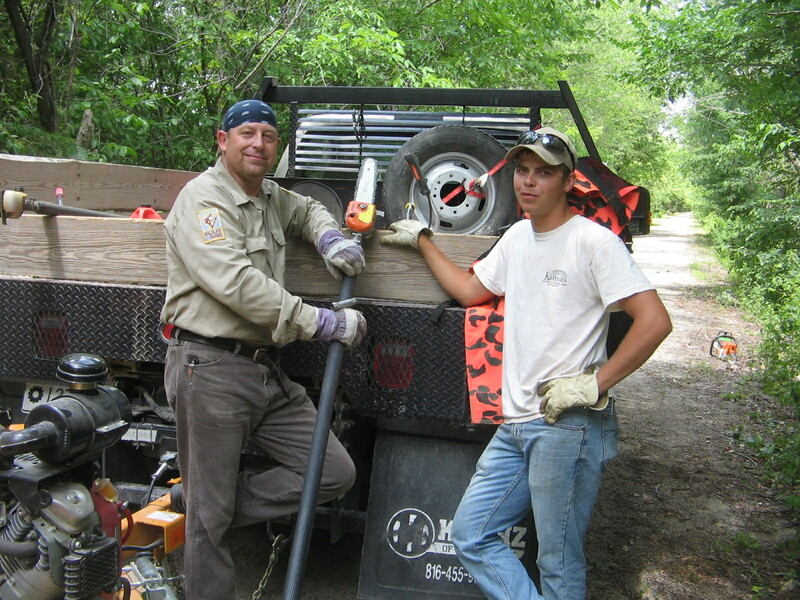 The first section of the trail was completed in 1996 and he was hired as trail manager the year before that. 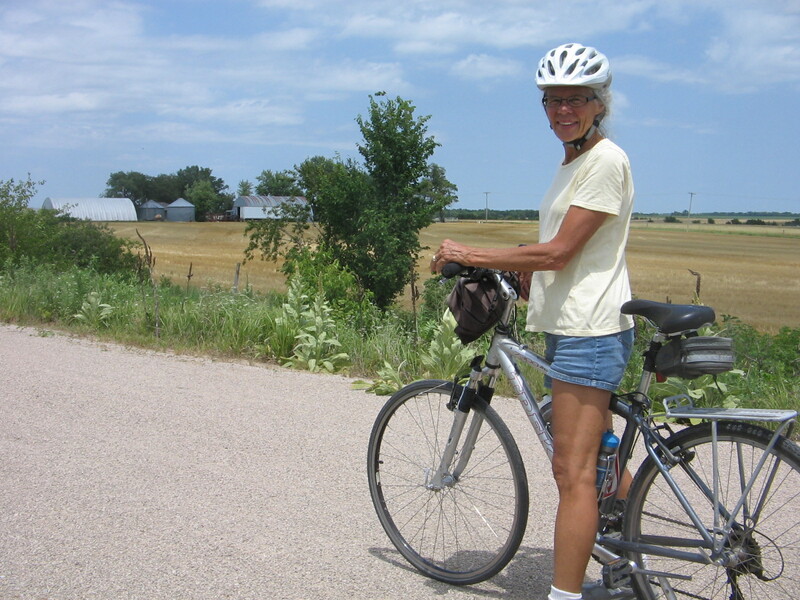 It was the first rail trail in Kansas and those who were advocating for the project met with a lot of resistance. 97% of the land in Kansas is privately owned and its citizens were not ready to accept the idea of a public trail passing through their lands, with people potentially trespassing and/or causing property damage. As it turned out, the trail has been quite a success and is featured in the Rails-to-Trails Conservancy Hall of Fame. Manager of Prairie Spirit Trail and assistant, hard at work along the trail. Some of the Prairie Spirit Trail passes through wooded areas. Wednesday evening we arrived at Jefferson City, Missouri, where we are spending 4 days at a motel. 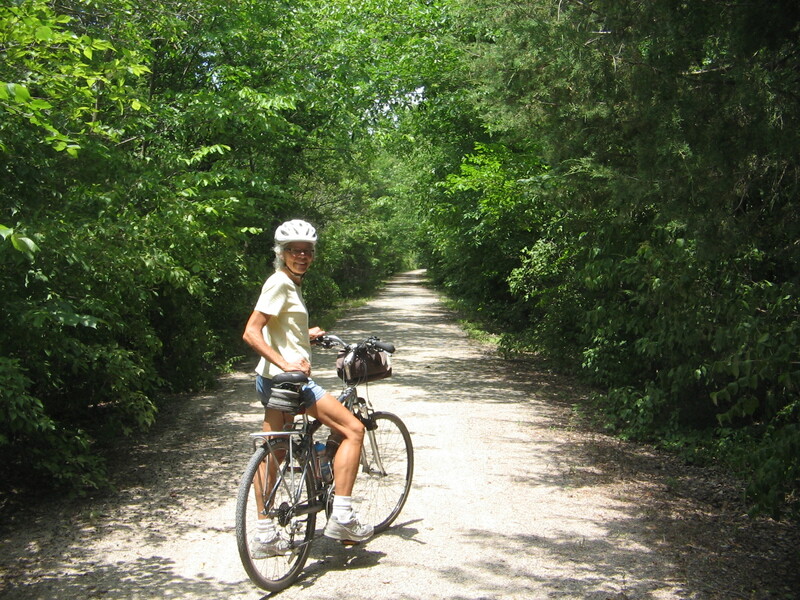 We will be doing some day bike trips on the Katy trail. It will then be time to drive to Iowa City where I will be able to get the road bike at my son’s house that we left there at the end of last year’s RAGBRAI. Then RAGBRAI training will begin in earnest. And, of course, the best reason for arriving in Iowa City will be to see the grandkids again! Hope you are enjoying a pleasant respite at the motel in Jefferson City. Sounds as if your Colorado and Missouri stops were enjoyable stops before you get down to the serious business of RAGBRAI prep! Enjoy the family visit and keep on biking!